After viewing Bob Clark’s Black Christmas, horror fans will struggle to view slasher classics like Halloween, Friday the 13th, or Nightmare on Elm Street the same way again. Black Christmas solidified the template that established many of the subgenre’s conventions and tropes, and with Halloween, laid the groundwork for Carpenter’s future success. In fact, Clark claims he gave Carpenter the idea for Halloween to direct as a sequel to Black Christmas. Each film is important, and each added new layers and dimensions to the prototype, but due to chronology alone, Black Christmas deserves serious props for being ahead of the pack. Shot with a $620,000 budget in Toronto during a wintry eight weeks in 1974, Clark weaves a holiday setting, point of view shots, the ambiguous character of a sexually deranged stalker, elements of the final girl theory, and the creepy “crank-caller in the house” motif into a splendid tapestry of horror. Clark’s dynamic directorial skills are also apparent in comedy as well with classics such as Porky’s and A Christmas Story to his credit. A special edition DVD of Black Christmas is planned for release in December 2006; a remake is scheduled for release that same month. 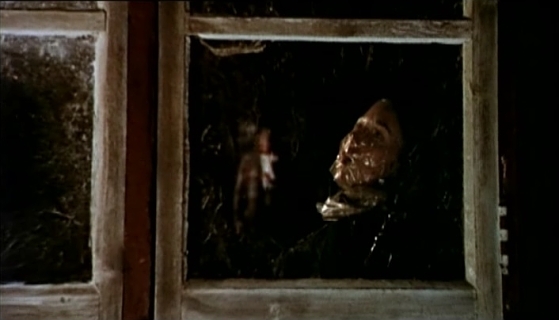 Black Christmas has shared as many identities as the killer it introduces. Its original script was titled The Babysitter and then mutated into Stop Me. 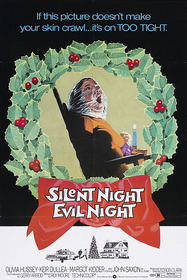 The current moniker emerged, but that title was changed to Silent Night, Evil Night because Warner Brothers feared viewers might mistake it for a blaxploitation film, which in the mid-1970s, was possible. However, the film didn’t find popularity until the title was switched back to Black Christmas. When the film was later released for television, the title switched again, this time to Stranger in the House. The film begins with an establishing shot of an impressive sorority house studded with Christmas lights. Suddenly, a point of view shot takes us immediately into the mind of the killer, who sneaks around the house and eventually breaks into the attic. He dwells there during the girls’ final party before winter break. One of the girls is missing, and a murder mystery ensues. During the investigation, the sorority girls’ characters and personal dramas unfold, and the killer soon interjects himself into the girls’ universe as a deranged caller who speaks in different voices and makes graphic, sexually deviant comments. The killer haunts them with more calls and attacks, and the film concludes with an unexpected, disturbing discovery. Claustrophobic shots abound, and the killer is typically shot in fragments to add mystery to his character and reveal his fragmented mind. We never see his face completely, but we frequently are trapped in his point of view. A good chunk of the drama unfolds at night, and many POV shots originate in closets or other tight niches and spaces. Clark and company do an excellent job of using every possible angle and inch of space in the sorority house to conjure suspense and surprise. The setting is equally effective in creating a chilling environment, both literally and figuratively. Although the snow and weather are never a focal point, they do linger in the background to remind us how cold and oppressive this narrative is. The sacred aspect of Christmas is constantly juxtaposed against the killer’s profane acts. Brutal murders, slashed throats, and sexually explicit phone calls undermine the festive aura of Christmas with its carols, lights, decorations, and trees. The phone calls, which seem to include different voices mixed together, are particularly unsettling. Feminists will have a field day with this film. Shot in a sorority house, Black Christmas is in many ways all about women and their status in society. Every female character that is a college student is in some way seeking more power or freedom. Jessica, Barbie, and Phyllis lead the way, and each is a rebel in the context of mid-1970s American society. Jessica, played by Olivia Hussey, is the strongest character, and that strength allows her to pursue an abortion contrary to her boyfriend’s combative appeals to have the baby. Barbie, played by Margot Kidder, is the outspoken, sexually liberated party animal who boasts about her sexual desires and heavy drinking. Phyllis, played by Andrea Martin, is the nerdy intellectual who serves as the antithesis to anything sexual. Martha Gibson is Mrs. Quaife, the house leader, who, as her name suggests, is portrayed as an aloof drunkard. And Lynne Griffin is Clare, the sacrificial lamb who, as the first openly sexual female in the film, is naturally the first to abruptly meet the killer. The potential interpretations about gender or feminism are too complex to explore here, but they are worth examining. However, one too rich to ignore is the potent commentary on abortion. Coming off the heels of the controversial landmark Roe vs. Wade decision, Black Christmas can easily be read as a morality tale about abortion. The film presents itself as a metaphor for what may happen to women who choose abortions. Jessica clearly wants an abortion, but throughout the film, her boyfriend, Peter, played by Keir Dullea of 2001: A Space Odyssey fame, is portrayed as the potential killer. He is furious about her decision to abort, and one can logically conclude that he may be the nutcase because of his fury. The overtly Christian images that appear throughout the film, most notably the crucifix that Jessica wears on her neck and thus directly above her heart, remind us of the “stain” she is committing on the Christian enterprise. In this context, her fetus is in many ways a fetal savior figure NOT being born, which is perhaps why this Christmas is black. Her abortion fuels the narrative and serves as a metaphor that seeks to justify male anger and violence toward women, particularly in the context of 1974 gender politics. The cast is notable as well. Besides the excellent female leads mentioned above, Dullea does an effective job of playing an on-the-edge pianist who just might not be the wisest choice to bring to the prom. John Saxon also does an admirable job as Lt. Fuller, the primary detective assigned to the case. James Edmond, who plays the father of a missing girl, and Art Hindle, who plays Clare’s boyfriend, are equally effective in their supporting roles. Black Christmas is not the best slasher film I’ve seen, but it is one of the better ones, and from a historical perspective, its importance cannot be overlooked. In this season of holidays, check it out with some egg nog, and remember, Xmas gifts are not the only things hidden in the attic. Submitted by a fan (not verified) on Wed, 2009-12-23 17:17. I believe that this film should be watch by every horror fan and as well be at the top of every ones horror list, of being one of the best. This film might be predictable and not scary, but at its time it was something that never was done…and terrifying. If it wasn’t for this film we might of not had half of the 80s horror slasher genre that we did. Halloween might have never been done, or at least not the way we saw it. Leading horror in a whole new direction from Friday the 13th, when a stranger calls, my bloody valentine, and etc. Thank Bob Clark for his ingenious portrayal of the first slasher serial killer on film. Submitted by Chris Justice on Sat, 2010-02-27 18:17. I'm with ya. Bob Clark is really a fantastic, eclectic director. Submitted by sean moor (not verified) on Wed, 2010-08-11 13:40.
carpenter admited that when he made Halloween he took lessons from movies he'd seen over the years.Debra hill said in an interview that nothing in Halloween was original. it is the simplicity that was original.Carpenter and hill was heavily inspired by hitchcock films as well as howard hawks.and i only seen some similarities in black x-mas that i seen in Halloween.Bob clarke even said in a couple of interviews that he didnt see Black x-mas as a slasher film.and i dont either.and it was irwin yablans who came up with the title "halloween" and setting it on halloween. bob clarke even defends carpenter from being accused of ripping off his movie.and how carpenter was an admirer of black x-mas.Heres a movie that came out in 73.and might have been made in 72' Its called "silent night bloody night" and it has similarities that black x-mas and halloween has.Though black x-mas predates halloween.it was halloween that pushed the slasher craze up front.and made those tricks like POV and such so popular.Halloween is MY PICK!!!!!!!! Submitted by Wayne (not verified) on Wed, 2010-12-08 11:53. I love this film but I think you're reaching saying this has a commentary on abortion. The only reason the abortion is in here is to make you think that Peter is the killer. He clearly wants her to have the baby but Jessica is determined not to. The phone call he makes to her while crying suggests strongly that he's crazy enough to kill. I'm just surprised you didn't notice the huge lapse in logic at the end. HOW does Peter know she's in the basement? There's no way he could even see her. Also and would he really break a window just to talk to her? He also got over that crying jag pretty quickly. BUT I didn't notice this until after multiple viewings. The first time I saw it on cable I had to sleep with the lights on that night...and I was in college! 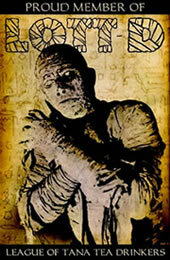 It is a great horror film. Submitted by Ray Crowe (not verified) on Tue, 2011-09-20 19:11. This film was so ahead of its time and still so impressive today. I never tire of it. The best Christmas horror film ever made IMO. Submitted by Alphawolf (not verified) on Sun, 2015-07-19 12:40. The most frightening film ever made. Whenever horror film buffs get together to rate films...someone inevitably brings Black Christmas up. It is without question the prototype for every slasher film ever made, including Halloween. At the time, a completely original idea.....this film is heads over heels more frightening than any that followed...purely by the very nature of it's killer. The casting is grade A....... the completely unconnected ending will stay with you......and you'll never look at an attic door in the same way again! Grade A......never been topped. Submitted by Alphawolf (not verified) on Sun, 2015-07-19 12:47. Typo........apologies tendered....my annoying spell check substituted the word "unconnected" with the word I actually typed...."unexpected"..... again, Black Christmas is a very scarey film....highly recommended.